A common method for setting up a quick image gallery on a website is to have small thumnbnail images which when clicked on pop open larger versions of the image (using a script like Fancybox). It’s a good idea to have some sort of effect on the smaller thumbnail images when they are hovered over to make it more user friendly (in the same way you might change the color of a text link when hovered over). One simple method is to put a colored border around the image with CSS and change the color of the border when hovered over. Another more exciting option is to apply a background shadow behind the image with CSS3 when hovered over. I’ve used both of these methods on multiple websites, but wanted a more exciting solution. What I decided to create was a transparent image overlay when hovered on. So when you hover over the image you would see a magnifying glass icon over a transparent black background. This would make it easy for the user to see where they are on the page. Another reason this method is better than simply changing the border color is that the magnifying glass gives an indication that the image will zoom in or expand when clicked on. I’ve create two ways of accomplishing this effect, one used jQuery, and the other uses only CSS3. Both methods use similar techniques, the only difference is weather they use jQuery or CSS for fading the opcaity. There is an image wrapped in a link. Inside of this link there is a span element. 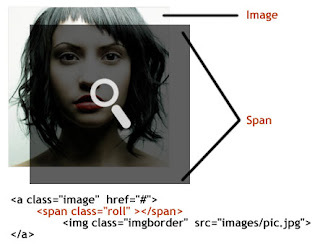 By setting the span to dispaly block, setting the width and height of the span, and setting a higher z-index than the image; the span element covers the image. By setting the background image and color the span element hides the original image. Setting the opacity to zero on the span element allows the thumbnail image to be seen. To create the overlay effect we simply change the opacity of the span element to 70% (or whatever you want to use for your project). 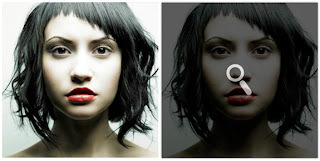 One method uses jQuery to apply this opacity, the other method uses CSS3 transitions and opacity settings. WHERE IS THE DEMO BUTTON TO THE TEST PAGE FOR ME TO TEST IN DIFFERENT BROWSERS AND CHECK IF I LIKE THE EFFECT AND RESULTS?? ?